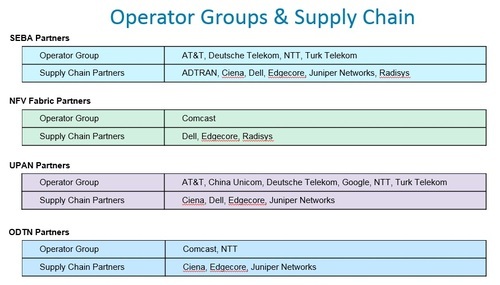 The announcements come less than three months after a major strategic shift put operators in charge of open source efforts to build a distributed cloud at the edge of the network with the intent of developing a common approach that would both speed deployment and build up a supply chain of vendor partners. Four such companies have stepped up -- Adtran Inc. (Nasdaq: ADTN), Dell EMC , Edgecore Networks, and Juniper Networks Inc. (NYSE: JNPR) -- committing $500,000 to the project as well as two full-time people over the next five years, which is the top tier of membership in the Open Networking Foundation . Early drafts of the four reference designs will be available in July. They include software-defined (SDN) broadband access supporting multiple access technologies at the edge; a network functions virtualization (NFV) data center fabric optimized for the edge; a next-gen SDN reference leveraging P4 technology for flexible data plane programmability and VNF acceleration; and a multivendor open disaggregated transport network (OTDN). "Operators have been hard at work over the last few months, we have new operator groups that have formed and a new technology leadership team and they have been meeting frequently," says Timon Sloane, vice-president of marketing and ecosystem. "We believe we are delivering on all fronts on this and making significant progress." In addition to the reference designs, the ONF process produces what it calls Exemplar Platforms which are deployment examples of a particular reference design that operators can actually download and consume. As with all open source initiatives, this one is generating its fair share of new acronyms (see above) as well as a new version of an old acronym. CORD, which initially stood for Central Office Redesigned as a Datacenter has now been re-dubbed Cloud Optimized Remote Datacenter, in recognition of the fact that edge computing won't be limited to COs, but will pop up in many other places including cell towers, cabinets and street furniture, Sloane notes. The new reference designs build on existing work but focus it specifically for distributed cloud computing at the edge. SEBA-RD, for example, is a lightweight reference design that supports fiber, copper and cable access technologies for carrier edges, while the NFV Fabric RD supports an SDN-native spine-leaf data center fabric optimized for edge applications. All of this work is happening within CORD, which is the umbrella project. Open source work continues on all fronts, he adds, and it's not slowing down to facilitate the process of developing reference designs and exemplar platforms. "While we are going 100 miles an hour, we are also adding this process to what we do," Sloane comments. "So if you think about connection between reference designs and exemplar platforms, the SEBA-RD is connected to a new SEBA project, which is a variant of R-CORD [Residential CORD]. Prototypes and variants based on R-CORD are already in early production. We are taking the learnings over the last two years and the operators are then tuning it and optimizing it for the edge cloud." As he points out, the NFV-Fabric RD's exemplar platform is Trellis, which is already in production, and the UPAN exemplar platform builds on Stratum, the next-gen SDN project led by Google that is expected to be in production by November of this year. "We are hoping the operators will be able to come out in public to discuss Trellis very soon but it is carrying a lot of traffic and starting to scale," Sloane says. Each reference design has one or more operator backers and Sloane says two or three more reference designs are likely to emerge this year as new operator partnerships emerge. 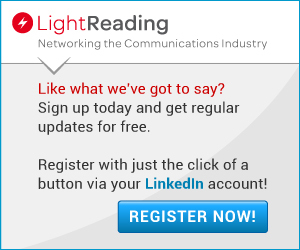 One of the newly engaged vendors, Adtran, has been working with variants of CORD, in the R-CORD and Mobile CORD arena for some time but is choosing to get more engaged in the process now in response to its operator customers. "The key value is that it allows us to focus scarce resources on things that matter most to the operator community," says Ronan Kelly, CTO of EMEA and APAC at Adtran. "When you engage with operators, you end up with wide and varied lists of things they want and it's sometimes difficult to get a consensus. This is bringing input from operators to one critical mass which will let vendors get things to market much faster." It also means some of what Adtran has already developed, for its Mosaic initiative for example, will now be "upstreamed" into the ONF process, admits Robert Conger, CTO, Americas. "Mosaic is a large software suite -- there are pieces of that that may make sense to crowdsource, and we get value from that, it enhances what we offer," he says in a interview. "It is a different model but it is changing for all vendors not just us. Every vendor has to make these decisions. If you want to hold everything back and watch everybody else, that is going to be a difficult long-term position to hold."